The Lao Brewery Company (LBC) has strongly reaffirmed its commitment to supporting Lao society, with particular focus on the fields of traditional culture, education, sports and the environment. The commitment was made by LBC Managing Director Mr Kissana Vongsay at a press conference on social responsibility held yesterday at the company’s headquarters in Vientiane. Speaking at the event, Mr Kissana said the company saw social responsibility as important, and takes it as both an obligation and a priority in the operation of its business. He said the company’s growth had been due to support from society. LBC has always backed social activities related to the preservation of Lao culture and the protection of the environment, with its latest commitment coming as part of its 40th birthday celebrations. Some of the many activities supported by the company include maintaining parks, promoting road safety to minimise accidents and getting behind the nation’s important days. The company has placed social and environmental impact management as a core element in its strategic planning and business operations. As a result, the company has supported several social development projects, has cared for first consumers and has contributed to the preservation of the environment. In the education field, LBC has helped school children across Laos access better educational opportunities by providing school supplies, resulting in children attending classes more regularly. The assistance was part of the company’s project to promote education in the nation’s 47 poorest districts under an agreement signed with the Ministry of Education and Sports in 2008. This project aims to improve young people’s access to education and assist the country to achieve its Education for All goals by 2015. 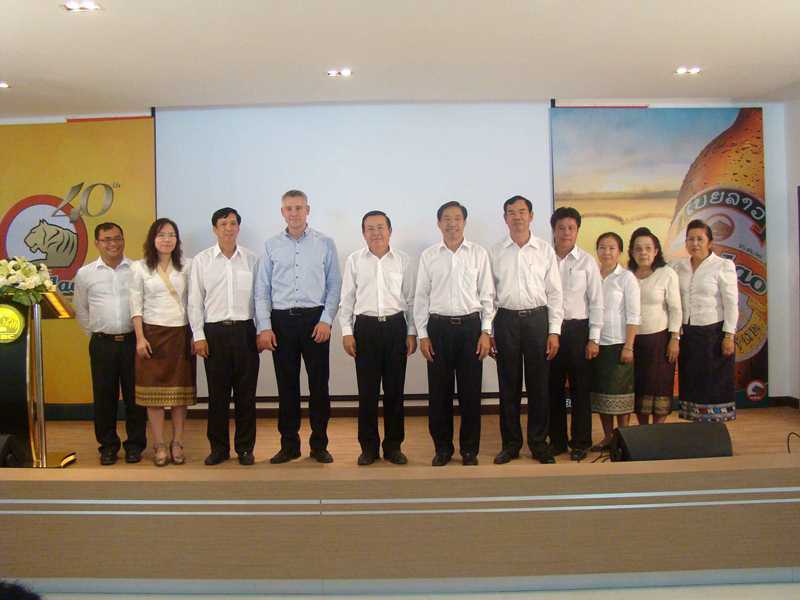 In addition, the company has provided scholarships for outstanding students from disadvantaged backgrounds to the National University of Laos. The scholarships, offered across a variety of faculties, cover university fees for the recipient’s entire course. LBC has become one of the top contributors to the state in Laos, with an annual tax payment in the billions of kip. An estimated 1,200 billion kip will be paid in tax this year. The company produces beer, soft drinks and drinking water, with its products exported to more than 25 countries around the world. ???????????????? 40 ?? ????????????? ??????????????? ????????????????? ???????????? 10 ?????? 2013 ?????????? ??????? ?????? ???????????????????? ???????????????????????????????????????? ???????????????????????????????????? ?????? ?????? 40 ?? (1973-2013) ???????????? “ 40 ?? ??????????????????? ????????????????????????? ” ??????????????????????? ??????????????????????? ????????????????? ???????????????????? ??????????????????? ??????? ????? ??????????????? ??????? ?????? ?????????????? ????????????? ???????????????????????????? 1973 ????????? ???????????????????????????? ??? ???????? ??????????????????????????? ????????????????? ????????? ????????????? ?, ??????? ?, ??? ?, ?????????? ??? ?????????????????????? ?????????????????????? ?????????? ?????????????? 25 ?????????????? ??? ????????????? 40 ?? ???????????????????????? ????????????????????????? ?????????? ?, ????????????????????????? ??? ??????? ???????????????????. ??????? ???? ????????? ???????????????? ????????????????????????????????????????????? 3 ??? ?????????????????????????? ???????? ???????????????? ???????????????????????? ??????????????????????????? ??? ??????????????????????????? ????????????? ?????????????????? ??????????? ??? ???????????????????????????? ??? ?????????????? ??? ?? ?.